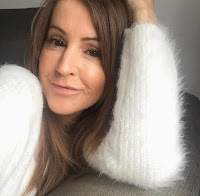 Since finding myself on the internet a lot more recently, actually it seems to have taken over my life, I have become really interested in blogs about home projects and house renovation and love looking into peoples homes. As I mentioned before I think it goes back to my nosey gene. I'm that person that walks by your living room window just when it's getting dark, you've just put your lights on and I'm staring in having a good old nose when you're chilling on your sofa trying to relax. Sorry I can't help it. I'm sure I'm not the only one. Am I? Or am I just plain weird? Anyway, I turned my hand to what you could call a couple of mini framing projects over the last week or two and thought I'd share with you. Here's the first and the best as far as I am concerned. I have put this in my entrance hallway next to the front door so all our visitors can see the photos. I have a range of pics of me and my sister, mum and dad and also some of the kids when they were little. 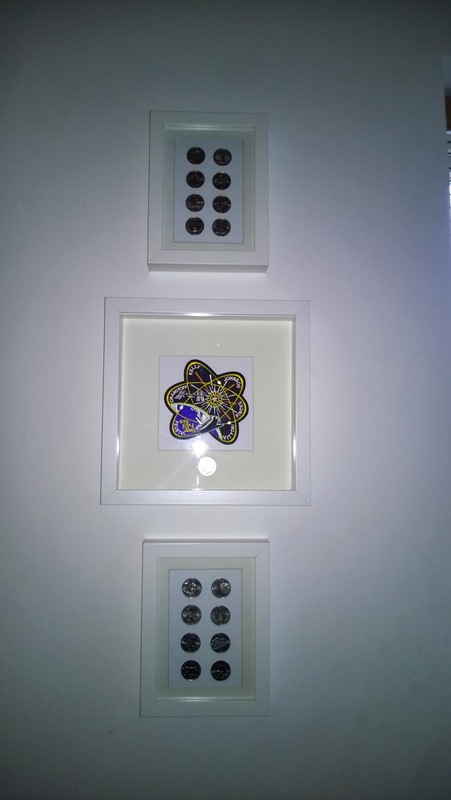 I have space for a couple more frames so will definitely be adding to it. 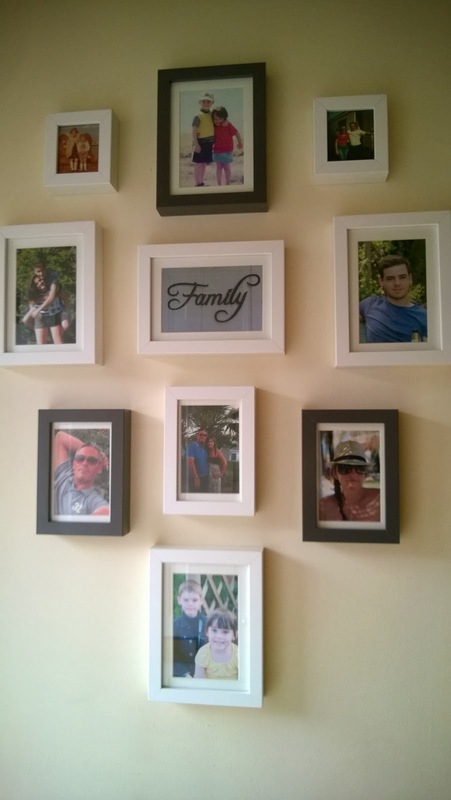 I am loving white frames right now but I added a couple of grey ones to tie in with a canvas print we have on the opposite wall. I absolutely adore my new picture wall and the great thing is you can change the snapshots as often as you like. This is the canvas on the other wall. 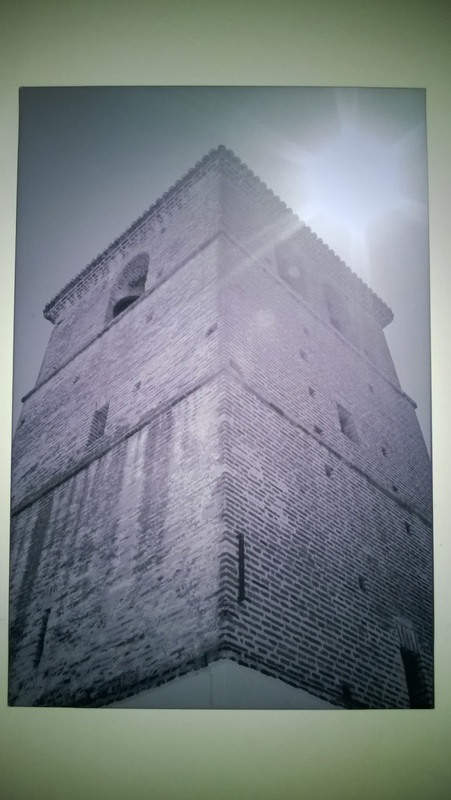 It's a stunning picture that my husband took whilst we were on holiday in Spain last August. It's the church at the top of the village in Mijas, Costa del Sol. We sent off our picture to a company called YF canvas. They print your picture onto a canvas size of your choice and then send it to you for you to assemble. Sounds difficult but it's actually quite easy and really good value. We had ours done in black and white, although it came out shades of grey and white, even better in my opinion, and we paid around £20. Here's another canvas that we had done by the same company. 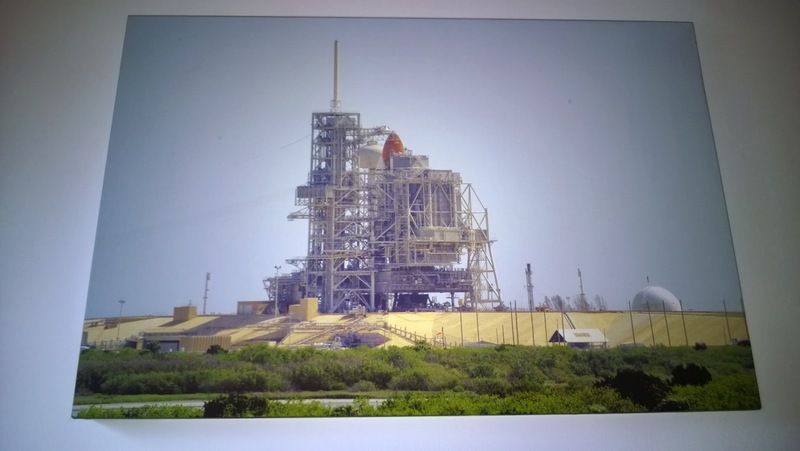 We went on a family 'vacation' to Florida in 2011 and visited Kennedy Space Centre. To say my husband was excited would be the understatement of the century. He has followed every mission and all the action for years and now misses it terribly. I'm sure besides our wedding day and the birth of our children this was one of the best days of his life. Not to mention the fact that when we went the shuttle was on the launch pad for the last but one mission!!! STS134 to be exact. WOW. The canvas takes pride of place in the office above his desk for him to stare at longingly. It's a great quality photograph and we couldn't believe how close we were. I think it looks like a print from a shop. 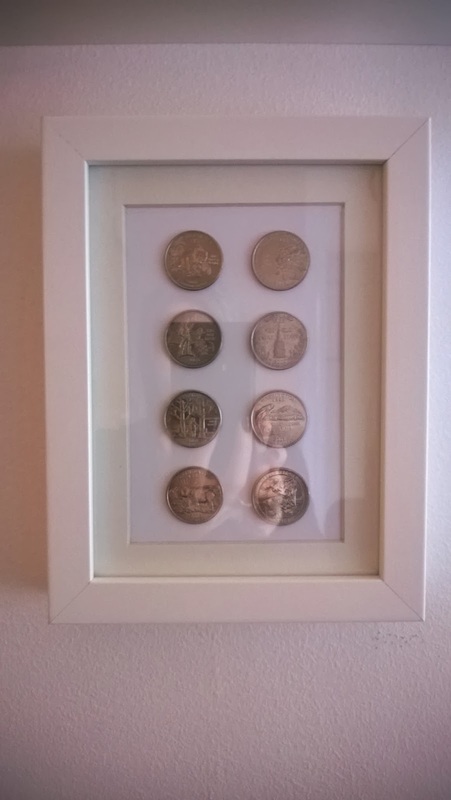 Whilst there we also built up a little collection of coins that have sat in a drawer ever since as we didn't quite know what to do with them. Here's what we just decided to do. Well, Mr C had the brainwave actually! I'll give him the credit for this one. Yep in white frames! We collected lots of coins for the different states but we've not got all of them so need another trip. Infact we are desperate to go back and see some of the real America, not just the touristy bits but think we'll have to save for quite some time yet (sad face). 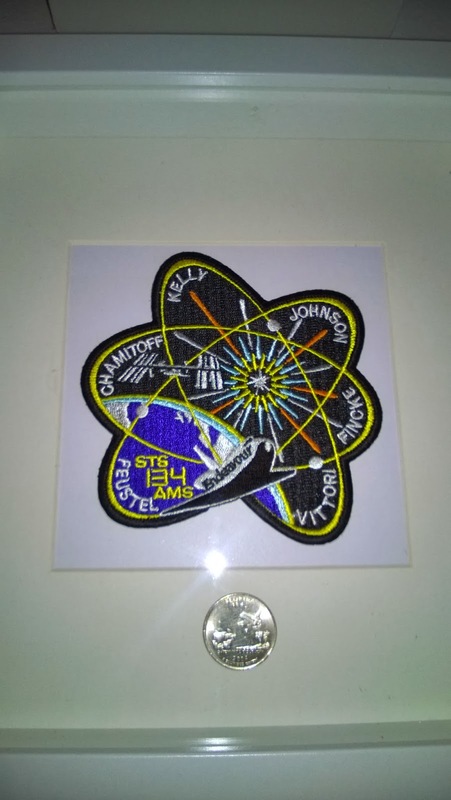 Above is the official Astronaut Mission patch which again weren't sure what to do with. It looks rather nice framed, don't you think? The coin underneath it is the quarter from Florida, depicting the great ship Discovery and the Shuttle from the Space Coast. 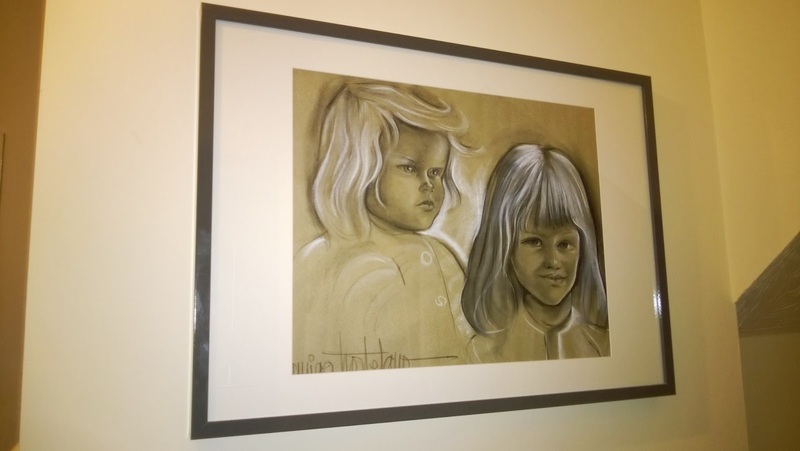 The final project is a framed chalk portrait of me and my sis when we were little. I'm the one on the right. Cute. I think I must have been around 6 or 7. Just look at the chubby little I wanna squeeze um cheeks on sis. I look like I've got 666 tattooed somewhere! Scary. We must have been such good girls to sit for the artist for this to be done. We were in Spain on holiday at the time. Dad showed it to me a few months back. It was looking rather tatty and in a broken frame. I immediately said I would have it and rescue it and look after it forever and forever. It was a little difficult to get it out of the battered old frame and I didn't want to rip it. I managed it with some TLC and just look at it now. I bought a high gloss grey frame from Ikea to blend with the chalk and I am chuffed to bits with it. As I say, all mini projects and nothing too much to shout about but I love them all and they really change the look of our home. If you are interested in putting some of your memorable and special photos onto canvas you may want to check out YF canvas, they have 60% off right now for your first order. It's easy to upload your snap and instructions are clear. One thing I will say is perhaps not order if you are in a rush as delivery is not the fastest. That didn't bother us. We were drawn as it's much cheaper doing it this way. Click here to find out more. I'm on the look out for more projects, infact they may well be big projects next time. As we speak Mr C is running away to hide all the screws, nails and hammer before I come up with any more ideas!!! Come on you lot out there in the big wide world, let's strike up some conversation about what you've been up to lately.